Looks like the new Tesla truck! At Iepieleaks, we’re much dependant on the efforts of our secret, global network of spies. We’ve heard that the Tesla truck will be on it’s way later this week, and look, we think this is it! Of course did we spot the ‘dark’ pics that Tesla teased earlier on the web. 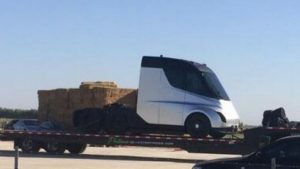 When we compare them with this picture taken in broad daylight, we suspect that this is the electric distribution truck Tesla has promised us. The entire industry is waiting for this and Daimler even introduced their new Fuso electric truck, capable to handle a GCW of 23 tonnes, as if to say, we can do better and sooner than Tesla. Keep watching our website, we’ll be back soon with more news! One Response to Looks like the new Tesla truck!